You can play the PC version of Firewatch with a mouse and keyboard, if you want. You can also use a controller—any kind of controller. 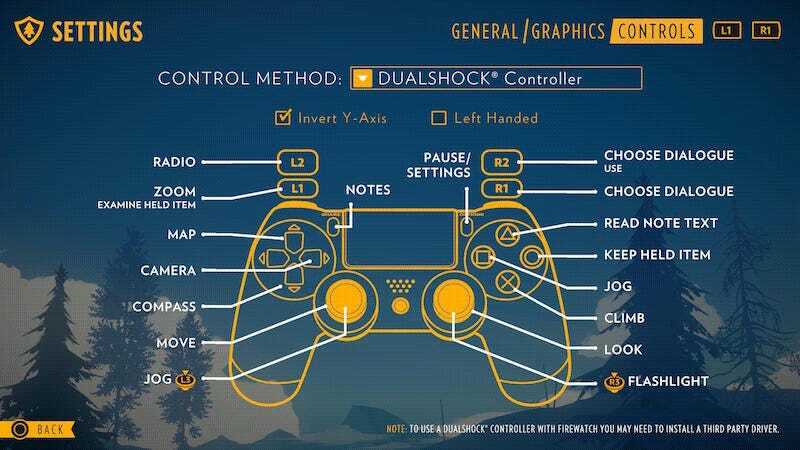 In the Firewatch menu, you have the option to change the on-screen prompts to match up with an Xbox 360 controller, a Steam controller, or a PS4 Dualshock controller. This is not the first time I’ve given a game props for this, but all the same: Yes! This! More games should do this! Most PC games still default to Xbox 360 or Xbox One button prompts. Some games do allow for on-screen Dualshock prompts, but it’s rarely an explicit menu option like it is here. A few games automatically detect that I have a PS4 controller plugged in—Arkham Knight comes to mind—but only if I turn off InputMapper, the program I use to trick the majority of PC games into thinking my Dualshock is an Xbox controller. It’s not a big deal in the grand scheme of things, but I like that Campo Santo has included control method as a menu option in Firewatch. I haven’t actually played the PS4 version of the game (I hear it has some bummer frame-rate issues at the moment), but since they made it, might as well include the PS4 button prompts in the PC version, right? I’ve never liked that the Xbox controller is considered the “default” controller for PC gaming, though given the ubiquity of Microsoft’s operating system, I understand why that is. These days, more and more people are using PS4 controllers to play on PC, so it’s nice to see more game developers letting their games reflect that. Who knows, maybe one day we’ll even get an official Windows driver for the thing. A guy can dream. Full Disclosure: I’m friends with a couple of guys at Campo Santo. We’ve never really talked about Firewatch, but they’ve had me on their podcast a few times to argue about Far Cry.